Some kitbashes, model edits and retextures of units I have made for various purposes, give credit if used. Please comment, suggest and report issues. Files marked as Beta means I may of missed something, please inform me so I can update them. Permission to use some of your Nerazim Structures textures for an Aesthetic Battle.Net mod? also -- nice looking medic there. Uploaded a normal-style marine with warfield's gun-arm. Uploaded an old project (centered planets) on request. I think you forget to upload the .dds textures. for ued marine. Its uses the rest of the textures as Ghostnova's, I figured anyone downloading it would have them. I'll link to his model as well as include them in the file. Updated UED marine .zip with the custom textures I forgot to add. Can you make some of this models? Had some time and was in the mood, did the Ultra/Torrasque portrait. 1. A Protoss Siege Tank. Don't worry about Siege Mode or the Morph. I just want the tank. 3. A Protoss Missile Turret. 4. A Protoss Siegebreaker. Don't worry about Siege Mode or the Morph. I just want the tank. 6. A Protoss Archangel. -Just fighter mode, and could you make it with 3 tails in the back not 4? 7. A Purifier Ark Shuttle. I used your assets in my map, Desert Strike Azure. Ok, comments are nice, please comment :P.
It all looks amazing. But if you don't mind me asking, why did you publish a new texture for the blue-eyed Firebat? It doesn't appear different at all. EDIT: The Firebat emissive texture with the blue eyes turns the other glowing parts purple. Was this intentional? The marine helmet firebats are, hmm. I'll try a few changes and see what looks good. EDIT: I published an addon pack with the fixes you suggested, as well as normal helmet yellow and black Firebats, A version of the expanded Medic with green instead of blue, and a Blackops-style Medic. Amazing work on those skin variations. Please note, the eyes look weird on the Firebats and Marauders with the marine helmets. Also, one of the Firebat variations is supposed to have blue eyes, while the eyes on the emissive texture are still orange. So I would suggest making variations of the emissive texture as well, so the helmeted Firebats won't have glowing eyes and the Firebat with the orange helmet will have blue eyes. Excellent set of files, Nolan! Hey, heres a idea I had if the creator of these assets is reading this. I was thinking you could make a Hybrid Amon asset, like the one from the campaign, but a unit. 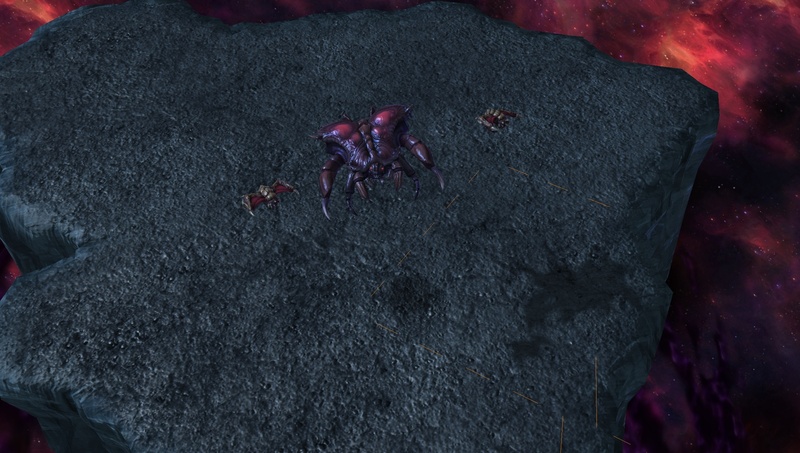 All you would have to do is edit the Zerg Hybrid model (Get rid of the jaw, tentacles on the back, change the color, get rid of the tail as well). You could use the Amon Hybrid Host Body STRUCTURE model to see how he looks. Really, Really hoping someone could do this.